Thousands of sixes have been hit in the ODIs but a few carry the fame that the six hit by Javed Miandad in Sharjah carries. A lively character and the pioneer of reverse sweep, the great right handed batsman is considered by many as the best that ever played for Pakistan cricket team. Born in Karachi, Pakistan in 1957, Mohammed Javed Miandad Khan, often known as ‘Javed Miandad’ made his one day international debut against the West Indies cricket team in 1975. During a mammoth a career that spanned a total of 21 years, he played a total of 233 ODI matches in which he scored a total of 7381 runs at an average of 41.70. To his credit, Miandad has 8 centuries and 50 fifties to his name. His highest score came against Indian cricket team in which he scored a 119* and subsequently helped his side win the match. The World Cup seemed to be the stage that brought out the best of Miandad; interestingly his debut game and his last match were both during the world cup. He is the first player to have played 6 world cups and the only second player to do it is ‘Sachin Tendulkar’ . It was Miandad’s skillful stroke play and sharp mind that led Pakistan to it’s first ever Cricket World Cup in 1992. 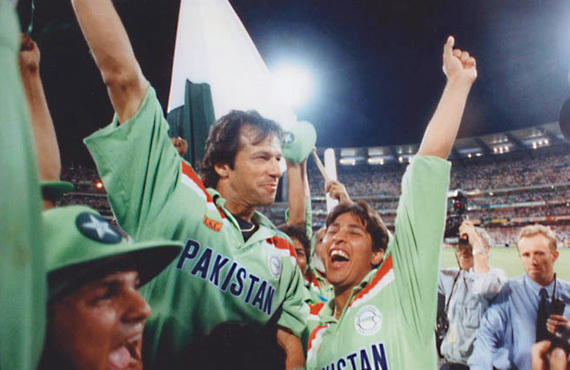 He played two vital innings in the semi final and final which meant that Pakistan lifted the crystal trophy. Miandad, to date is an inspiration for all upcoming batsmen and the world would till eternity recognize his fantastic contributions to the game of cricket.